To get a sense of the size of the paper it's 430mm (or 16.9 inches) wide and 142mm tall (5.98 inches). 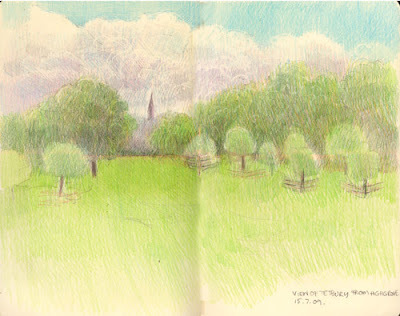 On Sunday, I went sketching in Kensington Gardens/Hyde Park with the RWS Friend group - and the new sketchbook came too. We met up at the Albert Memorial (table + benches and coffee stall within a few steps - what could be better!). I took one look at it and whipped out my new sketchbook and started measuring. I have to say it was a complete joy to draw something tall and get it virtually all the page for a change! It is so frustrating when you draw anything complicated and then find that it's moving off the page as you draw! I've had to hype the colours a little as I did find that the cartridge paper, as per usual, is not the best paper for coloured pencil. I'm thinking that I might try watercolour pencils and a water brush with it next in order to get better depth of colour. I then went and sketched the areawhere The Great Exhibition that took place in Hyde Park, London, England, from 1 May to 15 October 1851. More of that in another post as it became an exercise which is worth explaining. We had lunch sitting on the inside of the Diana, Princess of Wales Memorial Fountain. I was greatly intrigued by all the sign saying that people mustn't walk in the water. According to wikipedia six wardens are now engaged to stop people walking in the water. All I know is that while we sat eating our picnic lunch there was a constant stream of children all paddling and wading round the granite course which is filled with water - aided and abetted by their parents! Who on earth could be so silly to think you could create what looks like a rather sophisticated passling pool next to the Lido but that the children must not paddle in it walk round it? (Answer) It struck me as being rather like a grand challenge (like getting round a room without touching the floor) and was naturally going to attract children. I actually thought that was rather a good memorial! After lunch I sat next to the Lido (created in 1930 and used in warm weather for sunbathing and swimming) - in a light drizzle - and sketched the Serpentine Bridge. Of course the new sketchbook behaved beautifully again in design terms. This particular sketch has some natural smudging involved where the sporadic rain drops spattered the ink on the page. The waiter serving drinks just behind where I was sat was very keen to buy this sketch! I then turned my attentions to the geese who have line up next to the railings hoping for the leftovers. I sketched a couple who were having a very prolonged grooming session - they do do the most amazing contortions with their necks and feathers. I then walked back up the Serpentine, took a look at the long queues to see Jeff Koons' Popeye Series at the Serpentine Gallery and retraced my steps to Lancaster Gate tube station next to the Italian Garden and its fountains. My pedometer is having major problems (again - this is the second new battery!) and has given up displaying any information so I've no idea how far I walked but Hyde Park and Kensington Gardens are an excellent place for Sketchercise! Hyde Park is 142 hectares (350 acres) and Kensington Gardens is 111 hectares (275 acres), giving an overall area of 253 hectares (625 acres), making the combined area larger than the Principality of Monaco (196 hectares or 484 acres), but smaller than New York City's Central Park (341 hectares or 843 acres). After showing you the sketches of the views of and from the western aspect of Highgrove yesterday (see A visit to Highgrove - Thyme Walk and Lime Avenue), it occurred to me I could show you what it looks like on the other side of the house. Above you can see yet another one of my 2 minute pencil sketches done during Wednesday's garden tour which was then completed with coloured pencils to the best of my colour memory's ability! This then is the view you get when standing in front of the eastern aspect of the House. The front of Highgrove house and its main entrance look out over fields towards the town of Tetbury and the very tall spire of St Mary's, its Gothic revival church. One of the previous owners of Highgrove paid for the rebuilding of the spire on the understanding that he and his heirs could continue to enjoy an uninterruped view of it from Highgrove. The town derives its name from the Saxon Abbess Tetta who in 681 AD was granted land by Ethelred of Mercia to build a monastery. Tetbury is sited on a hill - hence why the tall spire seems even more impressive!. It actually lies on the site of an ancient hill fort which then became the site of an Anglo-Saxon monastery in 681. Architecture is one of the main interests of Prince Charles and I found out subsequently that Tetbury is regarded as a architectural gem. It became an important Cotswolds market town for the wool trade in the Middle Ages. Its town centre has a really impressive pillared Market House which was built in costwolds stone in 1655. It's still used for both markets and as a meeting place. On the day we visited it had a very nice small market where I bought a couple of lavendar plants and a bunch of lovely carrots! In addition, many of the wool merchants houses apparently still look much as they did 300 years ago. I know I was very impressed by it as we passed through and would very much like to visit again to explore and draw. So - if you are ever fortunate enough to be able to visit Highgrove, do make time to visit Tetbury as well and you won't be disappointed! 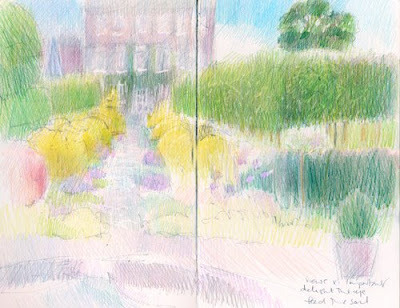 Yesterday I visited the garden at Highgrove with a party from the Prince's Drawing School. Highgrove is the family home of the Prince of Wales, his two sons and the Duchess of Cornwall. He bought it in 1980, the year before he married Diana, Princess of Wales and the garden has been developed over the course of nearly 30 years. When he bought it the grounds were very largely parkland and the house was very plain. This is a very visual garden - and one which amply fulfils the Prince's aim as stated above. Having visited very many fine gardens I think that it's one of the best I've ever seen. If, like other fine gardens which have been developed, it was one which had been made over by the Estate to the National Trust I'm absolutely convinced that it would be attracting hundreds of thousands of visitors every year as it certainly rivals the likes of Sissinghurst and Hidcote. As it is there's a long waiting list for organised groups seeing the garden. The visit is a tour conducted by one of the volunteer garden guides. We had a splendid one with a name I forgot to take a note of. She was very knowledgeable about both the garden and how it had developed. The tours are conducted whether or not it rains and the paths are ones which require stout shoes in wet weather. I'm going to write about this visit over more than one post as there was so much to see. I was sketching on my way round the garden - but I have to emphasis these were very quick sketches - approximately two-three minutes each and all 'done on the hoof' as it were. 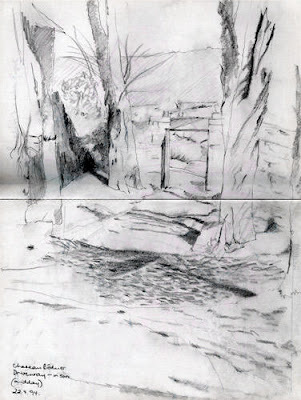 They were also limited to areas where the subject matters was suitable for a quick sketch done before we moved on. 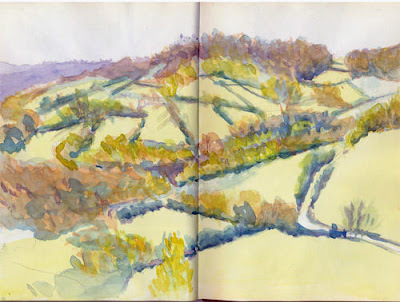 I saw many more views which I'd have loved to draw but which would have taken more time than was available. In practical terms, sketching fast meant big simple shapes were OK - while lots of flowers and lots of colours were not OK! 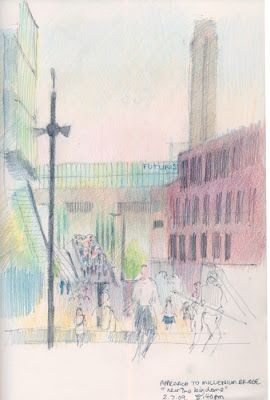 All sketches completed on site were done in pencil with annotations about important colours. I then developed them further on the coach going home and last night when I got back to more coloured pencils! I've trained my memory to stay fairly good about colour for about 24 hours after a visit. In this instance the colours are about right and there need to be more work done on values which I'll maybe revisit. Quick outlines and colour note annotations don't leave a lot of time for hatching values! It became very apparent to me that the garden has a strong architectural slant to it - strong structures underpin all the different parts of the garden and there are defined colour schemes (rather like Giverny) for particular areas. The planting them appears to be much more relaxed and has a more relaxed feel - until you notice that beds work particularly well because of the chosen colour scheme. I gatehr it's also a garden which provides year round colour. 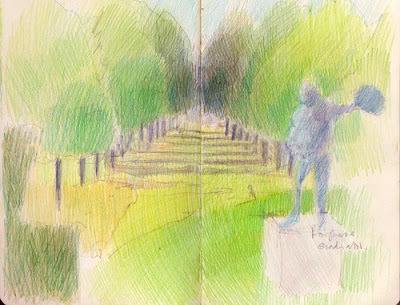 The first sketch I'm showing you (above) is of the view looking towards the western facade. It involves looking down the Thyme Walk and past the golden yew balls which has have been topiarised into fascinating and fantastical shapes and which mix very well with the golden thyme which also lines the path. and lavendar coloured plants which line the path. On the right you can see the pleached hornbeams which have been planted and cut to make a rectangular shape which joins up. The latter very much reminded me very much of Hidcote and the pleached limes at Sissinghurst. Turning 180 degrees and looking the other way meant looking towards what used to be a fine view of an avenue of lime trees leading down to a dovecote which is nor obscured. In front of them stands a statue of a bronze Borghese gladiator - copied from one at Houghton in Norfolk. notepaper of your organisation and get in the queue. The website suggests it could be quite a wait! When you get there you have to provide your name and address and also take proof of your identity (such as a passport) and address. You also cannot take cameras onto the Estate as no photography is allowed. 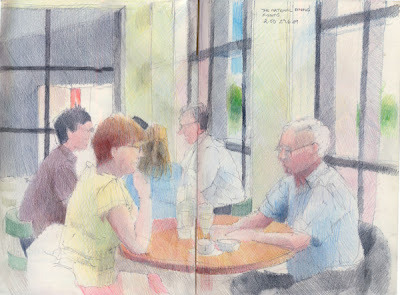 I frequently draw people in public places while eating in public places as restaurants, cafes and gallery tea rooms. 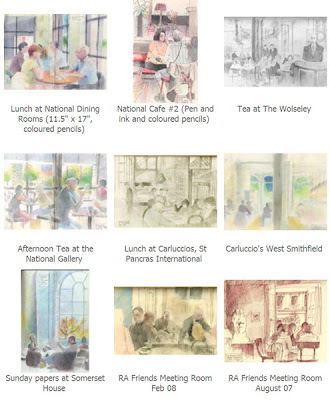 In fact I've drawn in cafes and restaurants all over the world - in the UK, Europe, North America, Asia and Australia. Lots of people tell me they'd never ever be able to do this. What follows are my dos and don'ts for being able to sketch people and interiors while eating - without it causing a problem for you. Do let me know if you try my tips and they work for you. DO tell them you want a good view as you intend to draw the restaurant. Be prepared to turn down the first table they offer you and indicate one which is better. I've always been offered better tables. I recommend back to a wall and in a corner. You then get an angled view. The bottom line is making sure you've got something to look at! DO find out which restaurants continue to serve all afternoon. This connects with what time to turn up (see DON'T turn up when it's crowded below) For example, the National Cafe and the National Dining Rooms at the National Gallery in Trafalgar Square are open all afternoon. DO tell staff that there's no need to rush with the food and an interval between courses is OK. 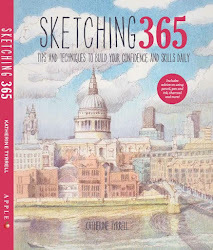 Otherwise you'll NEVER get any sketching done! Do remember to eat though! I always try and order something which still taste good even if goes cold. Of course sketching what you've ordered is also allowed! DO leave a nice tip if you want to go back and do the same thing again. Being nice to the staff is ALWAYS a smart move! You'll find lots of the waiting staff will want to try and see what you've done. then they'll tell their friends and before you know it they'll all be coming over to admire your sketches! 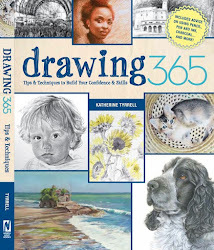 Remember people who can't draw at all are often envious ("I wish I could draw") and/or in total awe of anybody who can! DON'T be mean. You are probably going to take more time than the traditional customer so make sure you place an order which is commensurate with the time you think you;re going to spend occupying the table. DON'T turn up when it's crowded or at really busy times expecting to be fitted in. I only sketch over dinner in the evening when travelling on my own. Most of the time I sketch at lunchtime or in the afternoon. I find the best times for being fitted in as a single sketcher is if I get there very early when I get the best choice of tables I'm likely to get) or turn up after the main lunchtime rush when they're always pleased to see another customer. DON'T be too obvious about drawing the people in the restaurant. 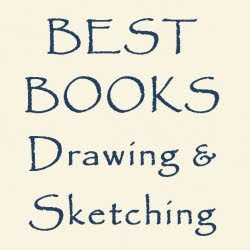 For example, I don't recommend sketching the people right next to you! You don't have their permission to draw them. However people often don't mind at all. If you get approached, don't assume they'll be annoyed. I've had people come across more than once to see how the drawing of them turned out. They're ever so impressed if you explain that you're an artist! DON'T draw faces. If people can't be identified they can neither object nor can they be upset if your drawing of them isn't flattering. Which is why the people in my sketches lack features. I draw their bodies and posture rather than their faces. You can do a lot with a good back! DON'T linger too long if they want to close up before the next service. If I know the place shuts between lunch and dinner then I always turn up very early. 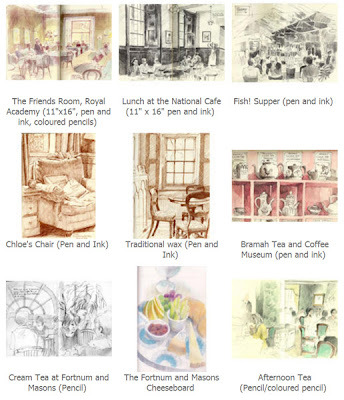 Do you have any suggestions for how best to draw people and interiors while eating. I've spent all week drawing life models in Channel 4's new Life Class and writing about it on Making A Mark. Most of the time though, I draw people who aren't models and who are sitting having a drink or a meal in a tea room, cafe, bar or restaurant. Plus they have clthes on! The other differences are I get to sit down, eating can be a bit awkward - and you have to warn the staff in advance not to expect to rush the food to my table or to expect to get their table back quickly! I never really draw faces - that's the quid pro quo for drawing people who don't know they're life models. They might know who they are but I'm not sure anybdy else would! 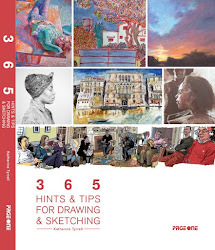 I don't know which is more difficult - drawing an unclothed model who's being paid to pose or drawing people who aren't aware they're being drawn and consequently MOVE the whole time! I've found that drawing people who are not models makes me observe much more carefully and draw much more quickly. I always take a look at what stage a party has got to with their lunch before starting to draw. It's no good starting on people who are just starting their coffees when if I look in the other direction I can find people just getting their first course. This is the view the other way round. I'm sat on one of the benches on Peter's Hill - just above Victoria Street - looking down the remainder of Peter's Hill to the Millenium Bridge and the Tate Modern. I then walked from here to Tower Hill in 30+ degree C heat at around 7pm in the evening. Everybody was out making the most of the heatwave before the thunderstorms start today. The bars along the riverside were heaving with people as were all the pleasure craft cruising up and down the river. In fact I don't think I've seen the riverside quite so busy in a long while! I idly thought about walking all the way home along the river and the Regents Canal - which is perfectly feasible - but maybe not on such a hot evening. My ankles said "No", I listened and I caught the tube home.